Kenedacom Data Recovery | Your Data Recovery Experts for Over 30 Years! To start your data recovery process, please read through the following outlined steps. If you're more comfortable talking to one of our technicians, then give us a call at 1-866-401-5860. If you would like to fill out our online evaluation form, then click here. Kenedacom's Data Recovery hotline is open 24 hours a day, 365 days a year. There is always a technician to answer your call. One of our helpful customer care representatives will immediately begin an evaluation of your immediate needs by asking you a series of questions. Your answers will help us determine the likelihood of recovering your data and the type of service you require. It's important for you to tell us which files/folders are most important. We would also like to know if you or anyone else has attempted to recover the data before bringing us your storage device. Depending on the type of data recovery service you choose, your data could be recovered a lot faster than you might think. Your Kenedacom customer care representative can help you decide which of our data recovery services is right for your time frame and budget. As soon as we receive your hard drive or other data, we will immediately log it into our own secure system. (For your convenience, you can either send it by courier or we can arrange to pick it up.) Your Kenedacom customer care representative will contact you to confirm receipt and gather more information about your data situation for our assigned systems engineer. Your hard disk drive or storage device is entered into our tracking system and put into our lab for immediate evaluation where, if possible, a back-up copy or image of your storage device will be made. As soon as the preliminary data evaluation is completed, your Kenedacom customer care representative will contact you immediately to let you know the results. If data recovery is indeed possible, a quotation will be immediately e-mailed to you for your approval. Your signed acceptance will authorize us to begin the data recovery process on your behalf. As soon as we recover your data, a Kenedacom systems engineer will subject it to strict quality control testing to ensure that it is returned to you in a useable and stable format. Call us toll-free for immediate assistance at 1-866-401-5860. We offer professional data recovery services for all hard drives, desktops and laptops, RAID systems, portable devices, USB media, and much more. We offer fast emergency services, including on-site pickup of the damaged media. Our engineers work around the clock including nights, weekends, and holidays to recover your critical data. 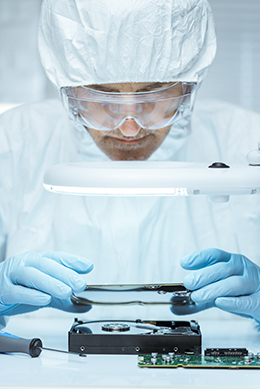 With more than 30 years of professional experience, and state-of-the-art facilities, you can rest assured that we have the best chance of recovering your valuable data. Fastest and most reliable Data Recovery service in Montreal. To begin your data recovery process, all you have to do is get started. We'll take care of the rest! Keep up with the latest trends in our ever-evolving industry. Enter your e-mail to subscribe to the Kenedacom Data Recovery newsletter to receive the latest news about our services and promotions. Kenedacom Data Recovery is fully-equipped to keep pace with every kind of data recovery challenge imaginable that results from drive failure, data corruption, viruses, user error, and other causes. We also provide data conversion, data duplication, and data erasing services. Serving all sectors (private, public, educational and non-profit), our fast-growing list of clients includes many top Canadian and international corporations and institutions. Copyright © 2019 Kenedacom Data Recovery Inc. All rights reserved.